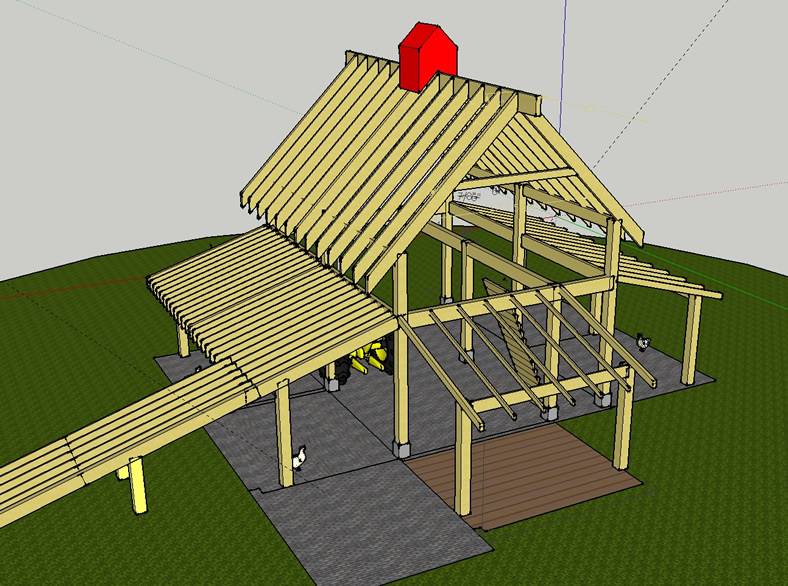 I primarily use Sketchup to design buildings. All buildings I design are intended for small-scale agriculture. This is the second chicken coop I modeled. It houses up to 100 chickens and rests on skids. It needs to be moved with a tractor. 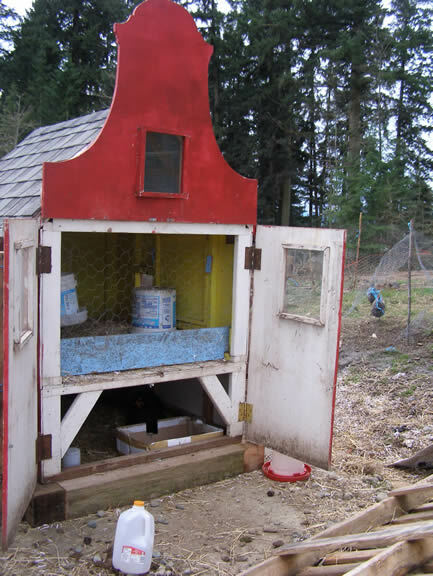 It has 2 pop-holes and a front door taken from a house, so is perfect as the centerpiece for a paddock shift chicken system. This coop is usually referred to as the "Dutch" coop - because its memorable facade shape is taken from a specific building in the van Hemert historic town of origin, Delft, Holland. The building, now a Subway, housed the printing press that the first Dutch bibles were printed with. 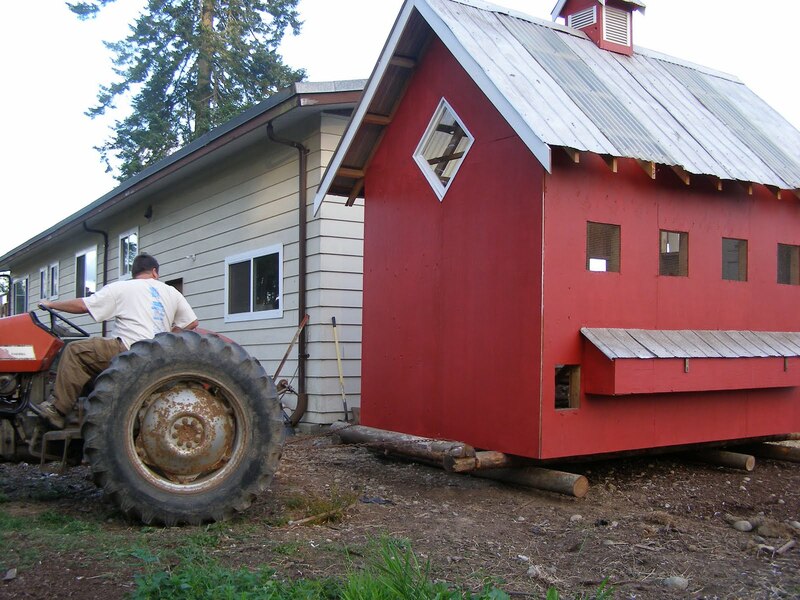 This coop started out as one story, but was expanded when chickens were found resting in the bottom, escaping from the heat of July. In true permaculture form, we let nature be our design instructor and created a second chicken living space below. This coop was originally designed for an urban context, but has since moved to a rural location. It serves as a brooder for new chickens, a sanitarium for sick birds, and a temporary jail for mischievous roosters. This large barn is currently under construction. The barn is meant to house chickens, pigs, goats, and to serve as an animal product processing facility. One side shed had twice as many rafters because it is intended to be a "living roof." In my experience, rabbits are a better urban meat source than chickens. 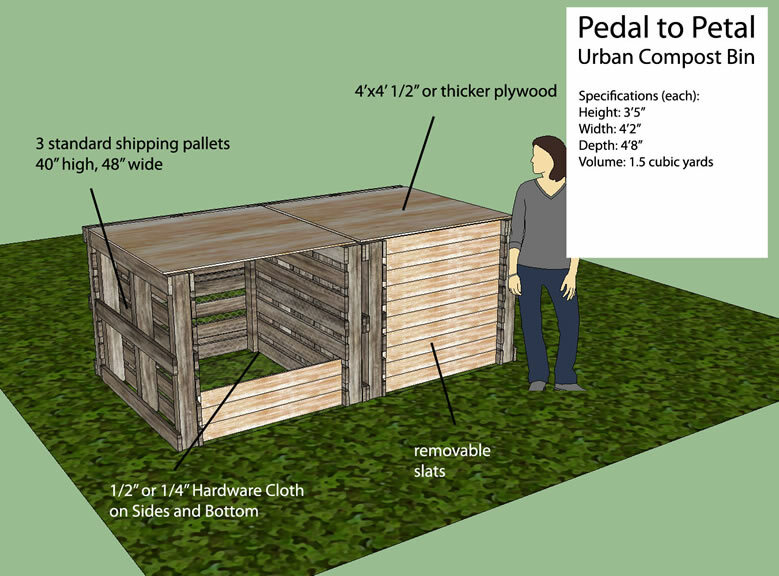 All of these rabbit hutches are meant for the city, although they could be used in a rural setting as well. This "brooder" has 6 square feet of floor space, and is therefore enough room for most mother rabbits with babies. 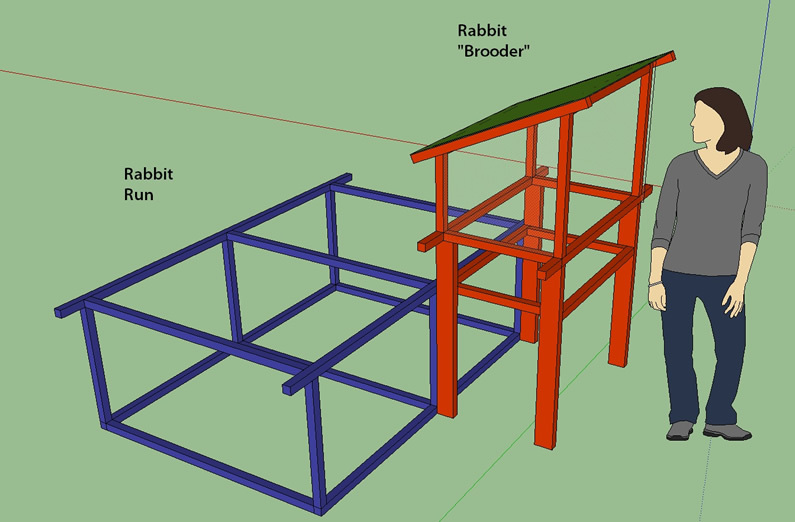 The brooder could also be used for a single large pet rabbit, or 2 small ones. The "rabbit skyscraper" houses 3 rabbits in a very small footprint, and is a convenient and humane option for keeping multiple rabbits in a very limited space. The frames are modular, and can be separated and carried about easily. 2 people or 1 person with very long arms are recommended for moving all rabbit housing on this page. 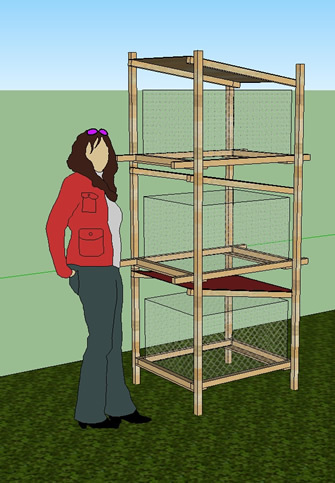 The interior cages are all 5 square feet, enough space for an adult rabbit, and are removable for travel. As the manager of a bicycle-based compost company, I am always looking for new ways to make my work easier. Good design of compost infrastructure is one of the best ways to eliminate a lot of hard work in the future. There are no plans to actually produce a mobile compost sifter anytime soon, but we may want to commission a trailer like this to be built if we start sifting large quantities of compost or other soils. The wheel distance could be adjusted to the size of a garden bed, allowing sifted compost to fall exactly where it is needed. This style of bin is very common, and actually very inefficient in many ways. 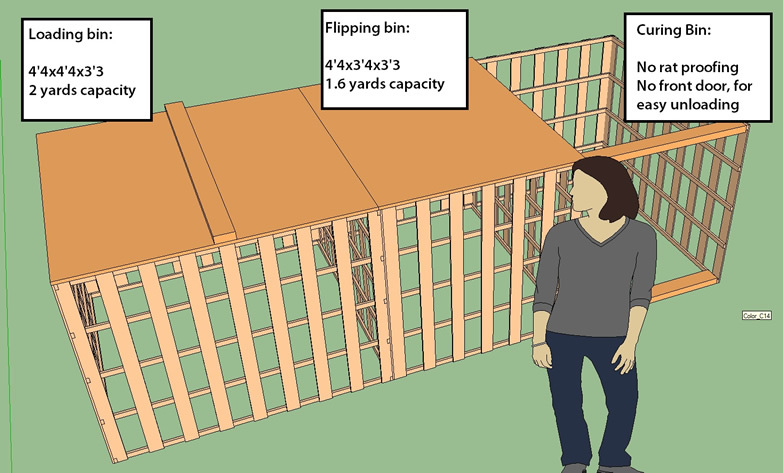 For a hot composting system where flips are performed, I strongly prefer a 3 bin system built with the thinnest pallets available, no front slats, and demising bin sizes. My upgraded bin design eliminates slats in favor of removable fronts. All that is required is a screwdriver, and rat proofing the lids and front is much easier than the previous model. The variable bin size is based on the understanding that compost will condenses down to 50 or 60% of its original volume. The left-most bin is always loaded first, then flipped 6 days after it has brimmed. Usually the mass of the diminished pile fits perfectly into the next bin, sometimes with just enough left over to leave a carbon layer on the floor of the first bin. Once the loading bin is filled again (this can take a full month or longer with a bin of this size), the flipping bin should be ready for emptying into the curing bin, and the loading bin is emptied into the flipping bin 6 days after being brimmed as before. I've implemented this bin system once fully, once partially, and once only on a two-bin level. Since the pallets I use are much smaller than standard, I can deliver the entire bin system in two trips with a bike trailer, and build all 3 bins in 1 - 2 days. I happened upon a supply of these non-standard excellent pallets by chance, and do not know what they are called. Each 4x3 pallet actually comes attached by wire to a 3x3 pallet, creating automatic hinges for me so I don't have to buy many hinges, and can economize on fasteners. This bin system requires almost the same footprint as a standard x3 pallet composting system, but in my experience is nearly twice as fast and efficient. Combined with my "continuous flipping" composter loading theory, I can keep a bin site designed in this way opened indefinitely.